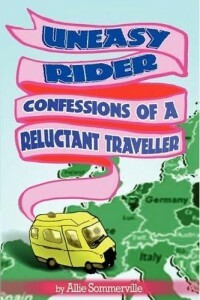 Allie Sommerville’s book Uneasy Rider: Confessions of a Reluctant Traveller contains a collection of such stories, accumulated over years of European motorhome travel with her husband (and occasionally their teenage children). This book manages the rare feat of being both hilarious and mildly educational and is a genuinely good read. I thoroughly enjoyed it, not least because it brought back some good memories. Uneasy Rider makes no pretence at being a guide book or serious travel diary and is all the better for it, providing readers with an insight into what it’s actually like to travel around Europe in a motorhome with only a loosely-planned itinerary to guide you on your way. The book is organised into 25 self-contained chapters that can be read in isolation or together. Along the way, you will learn just how different European campsites are to British ones (especially in Spain) and discover the joys of Alpine brake failures and unexpected cultural events, as well as learning to appreciate the simple pleasures in of motorhome travel – usually involving a glass of wine, bread and cheese.